Save time by emailing in online documents, files, and discussions from either your primary email address, or an alternate email address. 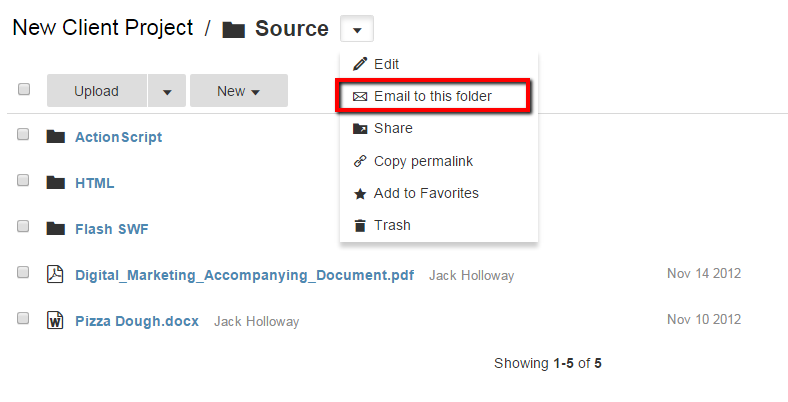 To email an item in, navigate to the folder, select the pencil icon and choose Email this Folder. Note: Only members of a workspace are able to use the email-in feature. More information on adding members to a workspace can be found here. You should see three different email addresses, one for new online documents, attached files, and discussions. Copy and paste the appropriate address into your email client or click the Email this address link. 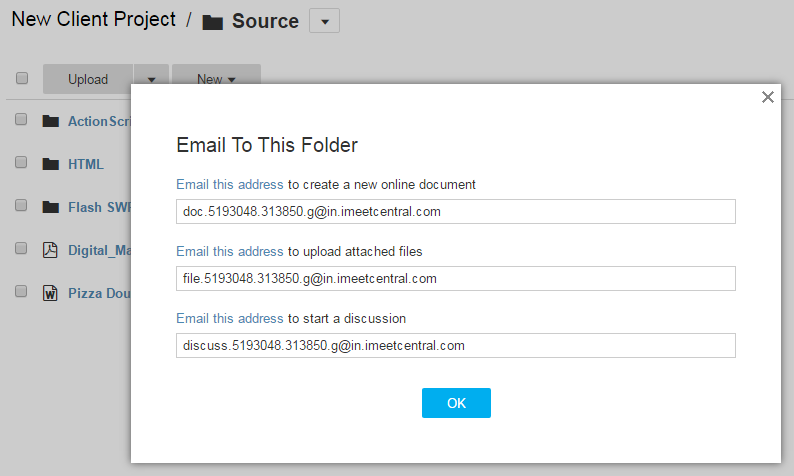 Use the "to create a new online document" email address to create a new online document. The subject of your email will be the title of the document, and the body will be the body of the document. Use the "to upload attached files" email address to upload a new file. The subject of your email will be the file description, and the body will be inserted as a comment on the file. "[YOUR FILE] was successfully received by iMeet® Central. However another File with the same File Name that you Uploaded Already Exists in Folder General. The File you emailed in has been inserted as a New Revision of the original File. No data has been lost." Overwrite: If you want to replace the current version of an existing file, put the word "overwrite:" in the subject line of your email. This option allows you to simply replace the current version of the file instead of inserting a new version of it. Note: Files are limited to 20mb in size when uploading via email. Use the " to start a discussion" email address to create a new discussion. For more information on creating discussions via email, please read our article on using discussions via email.